Spoiler: This post contains only one of the nouns in its title. Double spoiler: It ain’t a bear or Battlestar Galactica (though I do love me some BSG). Triple spoiler (for the slow-minded): It’s a beet! You know what’s sad? Up until maybe a year or two ago, I don’t think I’d ever eaten beets. Despite the fact that most people make a scrunchy-face of dislike when you mention beets, I didn’t particularly have any preconceived notions about them during my childhood. They were just one of those foods neither of my parents used. When I finally tried them, the first beets I met came from a can. And that first meeting was… well, it wasn’t great. Frankly, I was underwhelmed. If it had been a first date, I would have been reluctant to agree to a second, y’know? But hey, I like to give food – and people, for that matter – a second chance. First impressions might be hard to change, but not impossible. So when my CSA share earlier this year included beets, I gamely sliced one up and ate it raw. And you know what? That second, can-free meeting was a life-changer. I was hooked. Since then, I’ve felt like hitting myself for not striking up a relationship with these gorgeous veggies sooner in my life. They’re so versatile! Delightfully crunchy when raw, they’re also wonderful cooked. Last month, my roomie and I made vegan borscht, and its rich, satisfying, hearty flavors absolutely blew me away. Then, a few nights ago, I roasted them with some potatoes and felt like I’d died and went to a veggie-full heaven when I tasted the sweet, intense flavor of the jewel-toned beet-bits, what with their perfectly roasted, tender interiors and their slightly crispy, almost caramelized exteriors. 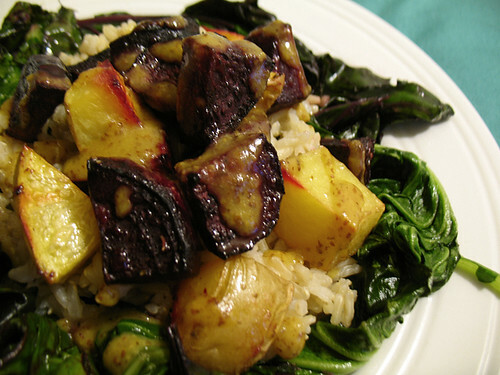 And then I piled the beets and the taters on a small mound of brown rice, arranged that on a bed of sauteed beet greens and tatsoi, drizzled the whole shebang with a tangy agave-Dijon sauce, and confirmed the fact that I was in veggie heaven. I know this photo ain’t pretty. I know it’s got some shiny spots, and the lighting’s bad, and the beets look burnt (they’re not). But I’m sucking it up and posting it anyway, because it was damn delicious. DAMN DELICIOUS, I tell you. I’m officially enraptured with these finger-staining root veggies, and I’m eagerly awaiting our next meeting. If there were a beet fan club, I’d join it. Clearly I should have been born a Schrute. Any favorite beet recipes out there? Or do you not like beets (you sad, unenlightened soul)? I think probably the canned ones should be outlawed. HA! You didn’t even need the “third times the charm” encounter with beets to discover your love for them!! Your meal looks incredible with all those lovely colors and textures. I was never much of a beet-lover until a few years ago. Now, if there isn’t a beet in my fridge, I’m a sad kid. My favorite way to use beets is in fresh juice with apples, carrots, beets, and ginger. Goodness in a cup! If you ever visit Portland, go to Portobello and try the Beet Tartare – it’s unbelievably awesome! Man, I need to get me a juicer! That sounds so amazing! I think I need to make a pilgrimage to Portland at some point. It’s essentially the vegan Mecca, right?! peel, cut into chunks, pepper + ground ginger, EVOO, roast til carmelized, about 75 mins at 425ish. the chili in the last post, looks awesome! did you by any chance make it in a slow cooker, haha..per my post, ive got slow/rice cookers on the brain!